Our sound sensitive EL Wire battery pack will add lots of lighting fun to your next costume or accessory. Runs up to 7 feet of EL wire. 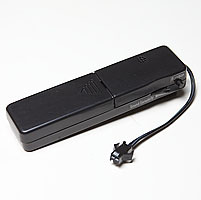 These battery packs run off two AAA batteries and include a solid on mode, sound sensitive mode, or blink mode. Battery packs are 4 inches long, 1 inch wide and 3/4 inches think. They also have a sensitivity adjustment and a belt clip for easy use.